Private Trust in India & their Taxation – Why should you consider them? Private trust in India is an effective estate planning & tax planning tool. This is a detailed article, will cover What are Private Trusts?, Why Private Trust in India?, benefits & limitations, Trust Vs Will, Private Trust Taxation in India, You can also check a presentation on Trust & WILLs by our member. I think after reading this post all your questions will be answered – also check 150 comments below this post. Rahul has been running a business for the last ten years. He has two children – four and six years of age. Rahul has been worrying about – What will happen to them after him? How will I ensure that their expenses are met? Who will run my business after me? All these thoughts are bothering him while planning for his own future. Situations like Rahul are common. In fact, most of us make the mistake by not taking proper steps in protecting our assets and transferring them to our children. The biggest problem comes when there is a premature death and children are not old enough to take care of themselves. Although a Will can be written for transferring the assets, it still has some limitations and cannot be the only mode of bequeathing one’s assets among the beneficiaries, especially in cases like Rahul. Creating a Private Trust resolves most of the problems and can be beneficial in the management and distribution of assets. The primary objective of any individual who wants to bequeath his assets during the lifetime or after death is to protect the interest of beneficiaries. The beneficiaries might include minors who are not old enough to protect their interests. A trust creation helps in meeting this objective. When there are one or more individuals like family members as beneficiaries, a private trust is formed. The trust can be created by any person who is a major and is capable of entering into a contract. Who benefits from a Trust? Nuclear and joint families: For a nuclear family, separation, legal hurdles, old age medical care, child’s future and financial security are concerns around which the whole life revolves. Contrary to this in a joint family there have been instances of family litigations leading to business interruptions and assets getting locked in legal battles for years. Many of these issues can be addressed through a private trust. Entrepreneur: An entrepreneur starts his business with a dream to grow big in the future. During the course he has to ensure his personal and business assets are clearly defined. Sometimes, a claim can arise from any of his client’s and the business gets disrupted if the solution is prolonged. By forming a trust the continuity of business and distinction between the assets can be taken care off. Family of a special child: They are the biggest beneficiaries of creating a private trust. A special child needs are regular medical assistance, financial support when parents are not around, preservation of wealth. By creating a trust, parents can make sure that above requirements get fulfilled in a very efficient manner. Muslims: Although Muslim laws are slightly different when formation of trust is concerned, the objective remains same for them. There can be many other situations where formation of a private trust can help in securing present and future of your loved ones according to your wishes. Cost: During transfer of immovable assets, stamp duty is paid as per the rate prevailing in the State. Due to this variation, cost of formation of a trust also varies across states. Trustees: Efficiency of a trust is highly dependent on the selection of the trustees. The trustees are to be appointed by the settlor. A wrong selection can defeat the objective of forming a trust. Trust deed: Drafting a trust deed is more difficult than a Will. If not drafted clearly, a trust deed is difficult to execute. Since a trust deed is never disclosed in media, it is more confidential than a will. There is no probate when you create a trust. When you want to make some changes in future a trust deed can be easily modified in comparison to a Will. While planning for succession, especially during one’s lifetime, one would not want to lose control over the assets. This can be achieved efficiently through a private trust as a Will gets executed only after the death. Lay down your long term objectives very clearly. It will help the trust to accommodate any changes later. To make your trust more efficient, make sure the trustees you decide have the skill and experience necessary for their prescribed tasks. Identify clearly who will be your beneficiaries to avoid any dissatisfaction later. Identify the list of assets which you want to include during your lifetime and in future when you are not around. Specific Trust– In a specific trust the income is specifically received by the representative assesses on behalf of a single beneficiary. Here the individual share of the beneficiary is known- for e.g. Mr. Ram will receive 25% of the total income of the trust or a minor daughter will receive the entire benefit from the trust. Discretionary Trust– Here the beneficiaries are more than one and the individual shares of the beneficiary is not known. The income of the trust is not received by a representative but determined by the trustees. When the individual shares of income in a private trust is identifiable, than the income is taxed in the hand of the respective beneficiary. But since income tax imposes the liability to pay tax on the trustees, in respect of any income which he receives or is entitled to receive on behalf or for benefit of the person, the tax can be levied and recovered from a representative assesse which is the trustee. The same is not true for a discretionary trust. Since the share of income is not defined and trustees decide the distribution of the same among the beneficiaries, the income of such trust is assessed in the hand of the trustees only at the maximum marginal rate. The above taxability rule is applicable when the income source of the trust is only from its assets. But the situation will be different when a trust has other sources of income such as a business. When a private trust is created by a will for the benefit of relatives. It is created exclusively for the benefit of any relative dependent on the support and maintenance. It is the only trust declared by the settlor. In all the above cases, even if there is a business income, the income will be charged at the same rate and in term a manner as it would be taxed in the hands of the beneficiary. One larger point to be noted is that there is no basic exemption available when the taxability is at maximum marginal tax rate. When none of the beneficiaries has any other taxable income which exceeds the basic exemption. If there are multiple beneficiaries and even one has the taxable income, the income of the trust will be charged at maximum marginal tax rate. When none of the beneficiary is a beneficiary at any other trust. If even one is beneficiary at any other trust, the income will be charged at maximum marginal tax rate. The income of the trust is receivable through declaration by any person under will and it’s the only trust declared by him. If the income of the trust (other than created by Will) is created before 1.3.1970, exclusively for the benefit of the relatives of the settlor, or of the members of a Joint HUF when trust is created by family, in circumstances when the relatives or members were mainly dependent on the settlor of their support r maintenance. Income is receivable by trust on behalf of superannuation fund, provident fund, gratuity fund, pension fund or any other fund created exclusively for the benefit of his employees. Avoid any business activity from the private trust you create for the benefit of your relatives. Ensure same beneficiaries are not created in more than one trust. If the trust is for minor son or daughter or spouse, ensure the fund are not through father or husband since in that case the income will get clubbed with them. Make private trust 100% specific beneficiary for major son or daughter so that money cannot be misused by son in future or relatives of daughter when she gets married. Hope this post gave you clear Idea of Private Trusts in India & their taxation. If you still have any question – feel free to ask in comment section. Estate Planning Basic- Even The Riches Missing It? Jitendra P.S. Solanki is a financial planning expert who has spent 15 years advising families on their financial wellbeing. After gaining experience in the corporate world, he started his own financial planning practice in 2010. Apart from traditional financial planning Jitendra also specializes in advising families with special needs children in meeting their financial and legal requirements. Married to a doctor, an occupational therapist by profession, he is the proud father of two sons. Jitendra is a SEBI Registered Investment Adviser, a post-graduate from IIT Roorkee and has earned the much-respected professional designation of Certified Financial Planner (CFPCM). He is also a Chartered Trust and Estate Planner (CTEP) and a Member of The Chartered Institute of Securities & Investments, U.K. Jitendra, a frequent writer and speaker at public forums, shares his views and wisdom, especially on planning for families with special needs dependents, through various media groups and TV channels. What and how if the private trust wants to start a business? Functioning of a private trust solely depends on the trust deed created by executor.If it allows the trust to start a business it can. Excellent succinct information. Thank you! Thanks for the appreciation Sachin. I am a member of a Co-operative Housing Society in Mumbai. I have created a Private Trust for the benefit of my family members. Now I want to nominate this Private Trust and hence accordingly I have made an application to the Society. Now soiety has objected saying that a Trust cannot become a member of the said Society. Please assist on the said issue. You can ask for copy of bylaws from the society and then refer to the Bombay Co-operative housing societies by laws which states that a Private Trust can become a member (Kindly Confirm it with a lawyer in Mumbai). For further actions services of a lawyer in Mumbai would be more helpful as i have expertise in Financial Planning . I want to get a private trust for my minor children. The sole intention is to reduce the tax burden on me. Will creation of trust result in creation of a separate file like an HUF which will be treated as a different entity? As a trustee, will the income generated by the trust be added to my income? I intend to create a private trust and transfer some of the money parked in fixed deposits that are currently in my name. I then intend to open new FDs in the name of the trust so that the interest received is not taxable. Is creation of such a trust advisable? Can you help me (or recommend someone who can) in creating such a trust? A private trust is a separate entity which works on the objective lays down in the trust deed. The trust income has to be filed separately and any tax benefits accrues to the trust and not any individual member. One factor which you need to take notice is that When a Private trust is created you have to lay down your objective very clearly. A tax benefit is not acceptable as an objective of creating a trust.If you are creating for your minor child then the benefits should accrue to him/her. 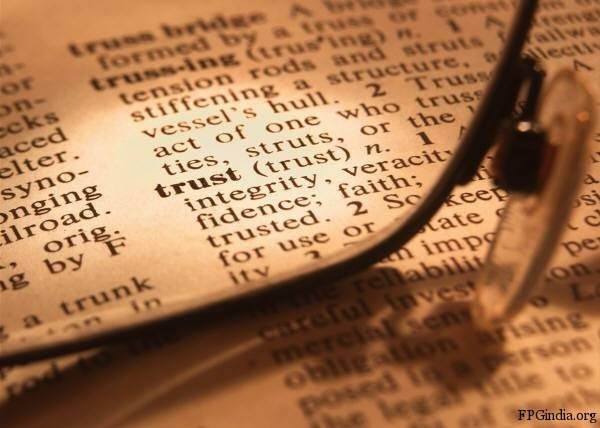 A trustee is only a person managing the trust and do not derive any benefit.Since the income of the trust is not added to your income you will not be able to claim any tax benefits.Even if you transfer some of your income to the trust the interest income will accrue to the trust and so the benefit will be claimed by the trust only. Since you cannot derive tax benefit by forming a private trust its not advisable for the saidobjective. I have gone through the details & comments on formation of Private Trust & like it. I am interested to form a Private Trust for promoting educational,sports,Health etc activities of my grand & great grand children. I have Property & Fixed in my Accounts. Would you kindly guide me as to what formalities and requirements are needed for this purpse. We are retired Govt Servants, having married daughters, well established & need no financial help from us. We are afraid that due to unforseen adverse circumstances our grand children may not be debarred from best quality of education and are curious that they should get atleast best education etc. & our funds be used for the needy grand children or other close family members or their kids, for uplift of their education,health,sports etc. I guess your guidance in this objective would prove very helpful for us. Thanks. You will need a trust deed and get it registered to form a trust.The objective of the trust had to be clearly laid down in the deed.I presume you already have decided on the trustees and the beneficiaries. Contact any good lawyer or a CA who will do the proceedings for you. They generally have a trust deed with them.Modify according to your objectives.Do note that trust deed should mention clearly the functioning of trust and the manner in which funds has to be utilized. I intend to create a trust specifically for donation and charitable purposes in memory of my grand parents. The purpose is to create an initial FD of 1 lacs and meet the trust objectives with the interest amount. Going ahead the capital sum would be increased on a progressive basis. 1. if creation of a trust is the right way to do it? 2. If Yes, How can i create a trust with the above objectives? 3. Also can u share a sample AOA and MOA for the trust. 1. A charitable trust is always a good option for the objective you have highlighted.It will also be tax efficient. 2.For creation and income tax benefit this link will clear your queries. 3. For Trust Deed you can talk to any CA or lawyer who will provide you and may help you in modifying it as per your objective. I wish to create a trust as elaborately and beutifully explained by you above for the reasons mentioned in item 3 above: (3) Family of a special child: They are the biggest beneficiaries of creating a private trust. A special child needs are regular medical assistance, financial support when parents are not around, preservation of wealth. By creating a trust, parents can make sure that above requirements get fulfilled in a very efficient manner. My question is while executing such a dead for the formation of the Trust – what basic precautions one has to keep in mind particularly when the special child is the only child in the family and even the trustees would also be outside the family. Your advice would be highly appreciated. 1. Estimate the future needs of the child first especially as an adult. Expenses related to care of the child which should include the hiring of various professionals.This will help in estimating what amount of money the trust will require for child care. 2. Decide who will take care of the child for day to day care and who will manage the financials.Can be on egurdia also or different individuals. 3. Its advisable to ahve more than one trustee. 4. A living trust is always beneficial where you can be atrustee and benefciary. The gurdian you have appointed can become a co-trusee.Since you will manage the trust this will help in straemlining the operations and the gurdian you have chosen will get an understanidng.Also you will come to know whether the guradian will be abl eto meet the objectives.In some cases the guardian sometimes backout in future due to their resposnibilities.You can change the trustee if required. 5. Estimate the assets to be transferred to the trust in your living and after you. You can chose to have it as per the need. But do have clear details like if its a property then how shoudl it be utilized.If its for living then whether it can be used for any income generaton for the chidl benefit or not. Similarly all assets should be clearly detailed in utilization.You can select which asset should be transferred initially and which later as once transferred you cannot claim it back.The income going to the benfciiary should be in detail to avoid any dispute later. 6. Have clear title that any gifts, insuranc proceeds should go directly to the trust. The trust deed should be in detail and clear about the transfer and income generation. However, determining the potential needs of teh child is most important to get the trust working for the child benefits. I hope this will help you in making the right decisions. Feel free to raise any further query you have. is it possible to form the trust in the name of minor child and make wife trustee for that. how it will insure the entrepreneur from mitigating the risks involved in business as mentioned in your article. can you elaborate it? and very precise and informative article you have. (b) with the permission of a principal Civil Court of original jurisdiction, by or on behalf of a minor. Thus you can create the trust on behalf of your minor child and Your spouse and you can be trustee of that trust.Do remember that a minor child needs a guardian till he/she attains 20. 2. For any enterpreuner claims from clients may arise. If the assets of business are included in the trust, they cannot be attached to any liability.This helps in protection of assets which business requires to continue. many many thanks for your very precise and competent guidance regarding the matter.hope to learn lot many things from your side. Please suggest best way to achieve the below by forming a Private Trust. Both husband & wife would form it and minor kid will beneficiary. 2-3 Relatives will be the Trustees. Assets are fixed deposits, shares, real estate and partnership in some business firms. 1. Its good to have one of the parents as trustee since you know the clear objective. This helps in not only streamlining the operations of the trust as per your objective but also knowing how other trustee will fair going forward considering that they will have their own responsibilities. 2. There are many aspects in a trust. Day to day affairs, Financial affairs,Non-financial affairs etc.Identify who will take care which aspect so that if there is situation arises when the trustee is no more interested in taking the responsibility you have an alternative.Also by bifurcating the roles & responsibilities the objective can be achieved in a refine manner. 4. Last but foremost, identify the exact benefit to be availed to the beneficiary and various cost (Like legal, financial advisory etc) which trust will have to bear. This will help in channeling the right amount of funds.at different stages. I hope this answer your query. I have real estate (residential) in Thane that I give out on lease. Additionally I have invested in Stocks , Mutual funds and fixed deposits. I have three children but I do not want to make a will and divide the assets among them in case something happens to me. If I make a private trust and allow it to manage my assets after me (and my wife) and let the three children (all of them are already adults) get only income from it , how will this trust function ? Can the three children along with a third party trustee manage the trust themselves? How can I prevent sale of any property via the trust ? What happens to the trust in case of death of one or all of the three children ? What is the period the trust is in operation? Can the children nominate their own children I.e my grandchildren as future income beneficiaries.? My main objective is to prevent the division and eventual obliteration of the assets that I have created. Is a private trust the best way to achieve my goal? Sorry for the number of questions ! Thanks . 1. A trust created through will can really be a good means of asset transfer. Create a will to transfer those assets which you want to after your death. This will help in avoiding any confrontation and is highly recommended for asset class like real estate. 2. Trustee- beneficiary can be the same person provided it is not unilaterally. This means the other trustees should not be the beneficiary. 3. If you want to disallow selling of any property you can impose a condition in the trust deed. 4. If any of the children dies, then the share can be either transferred to other children’s or as you wish to do it.You need to mention this in the deed. For more specific details i will request you to consult a good CA and a lawyer in your vicinity as there are many tax issues involved in the manner you transfer the asset or pass the benefit to the benfciiary. I want to protect my assets from litigation that may arise from marital disputes and am in the thought of forming a trust if that helps. What kind of Trust needs to be formed where I will have full control on the assets and will provide immunity from cases and attachment ? Can I be the sole member of the Trust ? Thanks for your kind answer soon. When you create an irrevocable trust you transfer the assets in the name of the trust. Although you loses the title of these assets, you still can have indirect control over these assets by becoming one of the trustee yourself.In the trust deed you can specify the investment mandate and terms you would like to have. However, you need to have clear titles and beneficiary when forming a trust.Also, there are many legal implications of your financial position on formation of a trust only for the benefit you have mentioned. Do consult a legal advisor and a good CA to derive the benefit from the trust. 1) Can husband & wife both be Settlors in the same Private Family Trust Deed? 2) If my father or any relative forms a trust as Settlor with my kids as beneficiaries, can I transfer assets to this trust? I wont be either the Settlor or Trustee of this trust. 1. A settlor/author is a person who create a trust and define the trust deed. I am not sure on having two authors but it will be advisable to have your spouse as one of the trustees. 2.You can transfer assets to the trust. However, there are specific tax laws and other considerations which you need to take care.You can do this by either donating to the trust or through a will. I talked to one lawyer and he said more than 1 person can be a Settlor. If more then one settlor is feasible then you and your spouse can become settlors and your child the beneficiary. If a settlor transfers real estate without consideration by gift deed to the Trust created for his kids, will the Trust be liable to pay income tax? A trust is a pass through entity and the manner in which the trust is formed decides the tax rate applicable.The income generated by the trust is taxable in the hands of the trustees.However, its the beneficiaries who finally bear the burden of tax. If a property is transferred to the trust then the income through it will be taxed in the hand of trustees or beneficiaries receiving the income as the case may be. How do we form a Private Trust that allows an immovable property to be sold after the demise of the author of the Trust and the proceeds from the sale to be deposited in a Trust account for the future benefits and welfare of a minor child’s care and welfare etc.? If you want to impose any particular condition in the trust you can mention in the trust deed specifically.The trust will function the way settlor/author create it. How the asset will be utilized when they are transferred to the trust or happening of any event will have to be detailed in the trust deed. Thank you Jitendra for your prompt reply. My mother instructed the formation of the Trust in a Codicil to her Will and has since passed away. As the Executor of the Will, Can I author the Trust Deed and comply with her wishes for the welfare of the beneficiary? If the details of the trust formation is mentioned clearly in the will then it can happen. My mother , in her will appointed me as the Guardian for my mentally retarded brother and also requested the formation of a private family trust with my sister and my wife as Trustees to take care of my brother. We are creating a Trust Deed to comply with these wishes and as part of the Trust Deed, will allow us to sell some immovable property and the proceeds of the sale amount, as determined by the will will be deposited into the Trust account, for my brother’s well being, as instructed by mother’s will. Can a private trust do all this? Hopefully my question is not too specific to be answered in a public forum? Also how can we contact you for more consultation professionally? Since a will is written the assets will get transferred as per the will . Also, for special child benefit a private trust is the most viable option and in your case it will function as per the will. However, a trust deed should be detailed enough to ensure the wishes of your mother are met and the benefit goes to the child. Your suggestions are highly informative . 1) I want to open chain of schools having classes from class 1 onwards , since it is mandatory to have a trust to run a school can I start a private trust and start running a school . I want to opt for private trust because I want my only child should be beneficiary after my death and should have full control over schools without any interference of other parties. 2)is it correct that if i opt for charitable trust then i will loose above objective. 3) I have started a play school under franchisee model which is run by my wife and I am in a private company job .I have on e male child- 5 yr old . Pls guide whether what i am planning is correct or should i opt for charitable trust because in that case trust will attract more donations for donor’s tax benefits which may not happen in case private trust ( 80 G benefit ) . another option can be that I enter in to charitable trust deed and keep me and my wife only as trustee and my child as beneficiary and my father can be settler. Thanking you in advance . A far as i know Schools in India have to be compulsory owned by a not-for profit trust or society or the government. Which means schools can be set up by only charitable trust and no surplus can be taken out. A private trust is more viable when you have the defined beneficiaries and the assets passed on to the trust are privately held.In a school the legal implications may be far higher since it is a highly capital intensive business. It will be good if you consult a good lawyer and a CA in this regard who will guide you more comprehensively. @ Pankaj, I can refer you a good lawyer who can help you with this. Let me know if you need his no. Yes Anu – Thanks I need his number . Thank you very much for valuable advise . I will hire a good lawyer . Thanking you once again . I have written to Mr. Patil . I am staring a new business for which I am the personal gurantor, I am 50years Old and want to form a trust and continue to purchase the propoerties in name of the trust. Yes, the property owned by trust cannot be attached to the individual by the future creditors. @ Jitu, any idea how much fees the Warmond Trustees charge for formation and consultancy for Private Trust? Have you used their services? They are doing a reasonably good job. You can mail them for fee structure. I recently learn about health problems faced by one of my cousins-in-law. Treatment for which is likely to cost high. The family has large number of members who would be willing to help with some financial assistance in the present instance. However, to tide over such unforeseen situations in future, I wish to form a Trust (if it serves the purpose) wherein each nuclear family or members of the larger family contributes a fund (periodically or one time) that will be used for such exigencies. Please advise the best option to cover such risk. 1. Expenses- There are many expenses which a trust has to bear. Legal, professional , fees and many other which are regular.Apart from this there can be one time expenses which can arise in future.So from where the trust will meet these expenses is an issue which need to be resolve first. 2. Trustees- Who will be the trustees managing affairs of such trust. You need to identify clearly with some options if any of the trustee leaves or has to be replaced. 3. Beneficiaries- The benefits to the beneficiaries will be defined or leave it to the trustees has to be clearly stated as the tax treatment of income is different in both scenarios. You will have to work on these and other aspects clearly before forming a trust. How to make an irrevocable transfer of gift from father to son? Son is not a minor and married. Should such a transfer be communicated to ITO. Or can I write a simple letter to this effect , that i am giving my son a gift and give it to my son. It depends on whether you are transferring a cash, cheque, movable items or immovable items. In case of Cash or cheque there is no requirement and you can do it through writing on paper.If it is a movable items like gold then it the writing should be on stamped paper and notarized. Registration is not mandatory. But in case of immovable property like house, a gift can be given only through a registered instrument signed by two witnesses. I hope it answers your query. @ Agarwal, it would depend on what is being given as gift? I know a lawyer who can do this for you, let me know if you need his contact. I would like to know if gifts given by close relatives to a beneficiary trust of a minor, will it be exempt or be treated as an income of the trust? Generally speaking A trust is created in the interest of near relatives, hence the gifts transferred should not be taxable as per the clause mentioned under section 56 (2). Still, take the help of a CA before coming to any conclusion. 2)If I am the beneficiary of a private family trust and I have my own income source as an individual also then in the income tax while filling my individual return I have to club the income earned through trust also as one of the beneficiary or both the returns will be filed separately. 3)whether a private family trust can gift any amount to another private family trust without any gift tax or any other such tax. 1. A private trust can be created for a person in your family memebers.Any beneficiary related to general public can be the cause of charity and so only charitable trust can be created for them. 2.Both the income have to be reported. For the process you should consult a CA. 3.I have less information on gifting from one trust to another. Probably a CA will able able to answer you more efficiently on this matter. have read your comments on formation of trust.I am a heart patient and want to make a trust for my daughter.Can you help me by suggesting a good and experienced lawyer/CA in making trust in South Delhi as I can not travel far away distances and also an idea of the fees. I am not in touch with such professionals in South Delhi Region. But if you are interested from other parts of Delhi then would be able to provide you some reference. Let me know. Yes , you can write to Mr. Sanjay Garg at sanjay_garg2001@yahoo.com for your query. I am 57 yrs old & retired. I wish to start a Private trust & run it myself with following objectives a) social welfare till I am alive b) transfer all my assets to the Trust through a WILL upon my death c) pay the beneficiaries through the Trust & d) continue the Social welfare. I need inputs on how to go about. 1. Firstly you need to define the Social Cause you want to do. If the beneficiaries of it will be public at large then a public trust will have to be considered. 2. For formation of a trust you have to identify the assets which you will transfer while living and through will. Ideally you should avoid transferring immovable assets like property to the trust during your living. The primary reason is that you will lose the control of the asset once it is transferred and the cost of transferring such asset will be high.An irrevocable trust will be a good option considering your lifestage. 3. You need to identify the exact cost of forming your trust i.e. its funding source & expenses, the trustees who will manage it, the exact benefit that will go to the beneficiaries and in what manner i.e. will the trust pays to the beneficiaries directly. This is very important as you can clearly states in the trust deed the manner of payment to the beneficiaries. Also identify what will happen to the trust post your death i.e. will it get dissolve or who will be the trustees who will manage it. You should form a trust with minimum two trustees i.e. you along with one of the future trustee who will take care of the trust post your death, if the trust continues. 4. Lastly you can write a will stating the transfer of assets to the trust after your death.The will should state clearly the assets functioning as per trust deed as and when they get transferred. I hope this answer your queries.Once you have identifies the above in detail, you can consult a CA & a Lawyer for the formation.But do identify the social cause due to the reason i have mentioned. Yes you are right. If the social cause is for public then you need to create a charitable/public trust. And as you mentioned you can write in a will how your asset will get transferred to the trust when you are not there. 1) What happens after the demise of a trustee? Can other family member(s) be the trustee(s)? 2) Can any property be transferable to a Trust. If yes, how? Can it be sold further? 3) Who can be the trustee? can he be the family member(s)? 4) what is family trust? 5) How can a trust be Dessolved or closed? what happens to the property? 6) Should one buy the property in the name of trust or it can simply be transferred? Or, can one buy the prop in his name and be appointed as the Trustee, in that case should the property need to be transfered to Trust? 7) Can trustees withdraw salary, how much? 9) Can I and my wife be the trustee of a trust formed by me? 10) Can the benificiary be changed afterwards? 11) When the benificiary attains majority, will the private trust property be transferred in his name? 12) Can one do business by receiving rent/income from the immovable property without transfering to the trust? Will reply to your email. An excellent article, just the kind I was looking for. I am 70 plus and own a small industry that is being managed by my sons. Your article has prompted me to create a private trust to manage the business and my assets both during my life time and after my demise. Can you please recommend someone in Meerut or NCR region who I could consult about the proposed private trust as well as my will. I am based at Ghaziabad near Anand Vihar. You can reach me at info@jsfadvisors.com or at 9971845454. Can four friends make such a trust? We would like to do some business. Is there any tax issue for such trusts? Yes they can make a trust. With Respect to taxation any trust which runs a business is taxed at maximum marginal rate. I wanted to know that what are the “charitable purposes” for creating private trusts? Any trust which is for charity and involve public at large has to be registered as a Public Trusts.A private trust is created when beneficiaries are specified like a member/members in a family. Dear Solanki ji, I am a48 years old and taking care of family agricultural activities. I need to know the followings. 1.. I want to start an ITI for which i have to buy a land and construction thereig on. I am the sole bread earner thru agri bussiness. I am alongwith my wife want to start institute under a private trust. Can I along with my wife make a private trust. 2.. I have a son of 19 yrs old studying b.tech and a daughter of 17 yrs studying 12th be the part of this trust. 3.. Whatever the income generated can be used for my son and daughter like their further study and marriage etc. 4.what will happen to the property under this trust if it grts dissolved in case discontent. In my view a private trust can be started when the beneficiaries are one or more individual. When the beneficiaries of the trust are public or class of public then it is constituted under a public trust. How you have decided to run this institute in the future i.e. from where it will get funded? Dear Sir, can you suggest me a good lawyer in mumbai who is an expert at Trust related matters to help me form a family trust. I have very specific requirements. Will appreciate it if you can email me the contact information. I know a team of CA & Lawyer based in Pune who can provide this service. Let me know if u need their contact. The decision rest with the court which take into account many factors before arriving to any conclusion. A private trust which invests/incurs expenditure on behalf of the beneficiary is eligible to claim deduction U/s VIA and is also eligible for set-off & carry-forward of losses. However, the deduction available to a private trust under SecVIA are limited. You should consult a taxation expert in this matter who will be able to guide you more appropriately. Your article is of great help plus the replies you have given. I request you to guide me to a professional and experienced person to help me to form and register the private family trust. I need to form a private family trust in Delhi and need your help to identify an experienced and qualified agency to help me to form and register the same in South Delhi area in Saket. You can get in touch with me at 09971845454 or write me at info@jsfadvisors.com. I do offer these services and will look towards assisting you as I am based at Ghaziabad, NCR. A Private trust created by a female in which her property is divided between 3 charitable trust. On execution of the will it was found that one of the trust has become defunct. Now can the trustees donate that 1/3rd part to any other charitable trust ?? In my view, if a public charitable trust becomes defunct or dissolved, then the trust assets has to be used for similar charitable purposes since Indian public charitable trusts are generally irrevocable. So in this case the assets can be used only for other two charitable purposes. But I am not clear on the manner of assets distribution. However, these are my views and not aware of any court decisions, if any,on this matter. It will be good if you also take assistance from a lawyer. 1. Trust created by movable properties. 2. Private Trust declared by a Will even if it involves immovable property. Registration of trust is necessary when it is created by immovable property (not declared through Will) for which a trust deed to be signed by the author of the trust or the trustee. The registration of trust deed will happen at the sub-registrar office within whose sub-district the whole or some of the property is situated. Regarding muslim private trust, i don’t have much information on its formation. Will have to seek legal help to offer you any assistance. provide me some time, i will come back with answer to your query. This is a great article. I have a question, We have a family trust which is almost 35 years old and there is only one trustee alive now. We would like to sell the property since there is nobody to manage it. What is the procedure for it ? or Can we add some family member to the trust ? How long will this procedure take ? Adding a trustee to your family trust rest on the conditions laid down in the trust deed. If it has given powers to the existing trustee to appoint another trustee, it can be very well be added.This can be done through a deed and getting it registered. If no one is alive or the person authorize fails to do it, court can also appoint trustees on petition by the beneficiaries. If you wish to sell the property even then you will have to look at your trust deed whether it allows doing so and under what circumstances. Till the asset is with the trust any transaction will be through it only. In general beneficiaries in consent with trustees can take such decisions but then the required number of trustees should be present as their consent will be required. If and when any trust (irrevocable) get dissolved due to any reason, the asset then get transferred to the beneficiaries.The conditions of trust getting dissolved are also laid down in the trust deed by the settlor. So in my view you should first look at your trust deed as to what it says on these two aspects. If I have information on it I can then give an appropriate advice on how to proceed. I will be mailing you a reply on your email. Dear Jitendra Sahib, Manisha has the same plan, as I. Is it possible to share the same with me. I am a 70 year old childless muslim have land in Pune. I wish to form my family trust for the benefit of my three adult nephews but there would be non to other relatives. I intend to register it with the sub registerar’s office in Pune. After my demise can any relative obstruct to implement terms of my family trust through the support of any Shariah law. I am worried about this so please help me. I have consulted a local lawyer but he is also confused. I do not have much awareness on formation of a private trust by muslims. Give me few days. Will try to resolve your query. Can you mail me your query in detail on info@jsfadvisors.com with few points on your trust objective. Will reply. Basically i have a small business for selling franchisee or any thing which comes to me to earn my living. One of my client gave a proposal that his relative has a private educational trust having 12 trustees running a college(engineering) and they want to sell it. Now my problem is i dont know what documents i should check or ask from them or what is the procedure for the sale or transfer of trust.they haven’t provided ant thing except their financials. please guide me in this as i have big liabilities to pay and commision from this sale will help me to get out of it. You need to check the trust deed. Financials will give you only a picture of the functioning of the trust but any limitations on selling it i.e. in what conditions the trust can be sold or control of the trust can be transferred and by whom should be mentioned in the trust deed. If I can have a look at the trust deed i can then probably advise you more and take the view of my experts team to check in the procedure. Or if you can find out from the trust deed let me know the specific content. If you wish to speak to me personally in detail on this case you can call me on 09971845454. I would like to know in case of a pvt trust, if a mere change in trustees would tantamount to transfer of immoveable property and if stamp duty will have to be paid while amending the trust deed for giving effect to change in trustees although the beneficiaries remain the same. Thanks. Trustee have a legal authority to control the properties but the properties are held in the trust name. Stamp duty will apply only when there is a title transfer of the property. Since the change of a trustee does not amount to title transfer there is no stamp duty or any such charges. Thank you sir for the reply. Will change in beneficiaries of the irrevocable discretionary private family trust amount to transfer of property or attract stamp duty payment as conveyance under Karnataka Stamp Act? In general the properties are in trust name and unless it changes the transfer of property should not arise.I have not gone through Karnataka Stamp Act if it says anything specific to a trust. Also changing of beneficiary in an irrevocable trust- This provision should be there in the trust deed. In my view you should go for a review of the trust deed so that you can get clarification on many such matters. Please enlighten me with the valuable information as I am just going to open up a Private Trust. Can I invite donations or assistance including governmental support for carrying forward the main goal of my trust. At the same time Ialso need to solidify the interest of my wife and only son from any difficulties in the future when I am not around. The main goal of my Charity would be to help students to learn English besides other activities in the field of education, physical training and development and other social welfare etc. Thank you so much for the free kind advices. You are trying to create a Private Charitable Trust if i am not wrong. Give me some time to come back with few suggestions as there are many legal hurdles when you wish to create a private trust for charity. Meantime can you elaborate more on the purpose of the trust and the benficiaries. You can mail me at info@jsfadvisors.com. 1) I am married–age 74 years. My wife is 73 years old. We have no children. We live in a prime location/apartment in Mumbai. 2) I do not get along well with my wife’s brother (who had taken several loans from me, but not repaid any). My relations with my wife’s brother have soured. However my wife & I have a normal healthy relationship. She understands my reasons for avoiding her brother, but she has to maintain her relationship with him & I do not discourage this. 3)My main asset are mutual funds & the Apartment we live in. The value of my assets are considerable. a) If I predecease my wife I would like her to enjoy the benefits of all the assets, without transferring or loaning any of the funds to her brother or any family members &/or any one else. b) After my wife’s demise I want the residual assets to go to my nephew & niece. c) My wife & I have made Wills (through by a lawyer). My wife’s Will states that if she predeceases me, I will be the sole benefactor. My Will states that if I predecease her all the assets will firstly be transferred in her favor & she will nominate my nephew & niece, so that they inherit the assets after she deceases. d) I am not satisfied with my Will. Although she has signed an undertaking in my Will, that she will sincerely adhere to to the conditions specified therein, nothing legally stops her from changing her own Will (perhaps under pressure from her brother) & nominating her brother or other family members for inheriting the assets (instead of my nephew & niece). e) My wife is presently dedicated to me. She is a very simple person & is likely to lean upon her brother for assistance on various issues & in the process may also change her Will in favor of her brother. f) I think I should form a “Living Trust” & clearly spell out my requirements. Will such a Trust need to be registered & a Probate obtained? She will not be able to handle this &/or interact with lawyers & the complications involved. (She may not get any support from her brother). g) Your advice will be appreciated. Kindly respond asap via email. Mr. Mehru…. I was in similar situation and as per my lawyer’s advice I got a Trust Manager appointed as a watch dog who monitors all the activities and will make sure that neither the Trustees nor beneficiaries fool around the assets after I am gone. What Jaya has mentioned is also one the good options. I will give you detailed reply on your email. I have a private educational trust and I’m interested in starting up my own school now in a joint venture with Venture Capitalists wherein they will be investment partners. Should I make them trustees or should I form a new partnership firm or LLP? Please give me your mobile no. for better discussion. You can get in touch with me at 09971845454.
your article and discussion helped a lot to me thanks for sharing such knowledge. I want the format of dissolution deed of private minor beneficiary trust which have been formed when the beneficiary is minor. Now the minor has attain 18 years of age and the trustees and beneficiary wants to dissolve the trust. Kindly provide me with the procedures and the format regarding dissolution of private minor beneficiary trust. Give me a day or two. I will come back with reply to your query. You can also get in touch with me at info@jsfadvisors.com. I wanted to know the tax implications on income to and from trusts. In my personal account I have listed equity shares and tax free bonds. The income from them (dividend and tax free interest) are not taxable to me. I wish to transfer them to a trust and mention that the income from them to be transferred to me and my children equally. On this income, do the trust or the beneficiaries need to pay any tax? Related question: If there is any short term gain in shares, will the trust (or trustee) and / or beneficiaries need to pay any tax on that? Once you transfer the asset to the trust then it is the property of the trust. Since a trust has a seperate legal entity any income derived from investments of its assets are taxable seperately. Now taxation of the trust varies based on whether its a specific trust or a discretionary trust.Then there are few exemptions available. But in general the income from the trust assets is taxed either in the hands of beneficiary or at the trustee level as representative of beneficiary as per the tax slab applicable. Yes if there is short term capital gains then tax will be payable by the beneficiary in whose income it is added or trustee if it is a discretionary trust. To be more specific the trust and the distribution of the income will have to be understood in detail. 1. The trust will function as per the provisions made by the settlors. So if you allow any business activity which involved selling and buying of any asset, yes the trust can do it. What matters is the taxation of business income. Any trust with business income is taxed at Maximum Marginal Rate and not at individual income rate which you have to take in consideration. 2. Any income of the trust goes to the beneficiary. Trustees does not have any right on the income of the trust for their personal use. So if you are one of the beneficiary the income will come to you in the proportion as you decide in the trust deed. 3. For paying to the trustees you can either have expenses reimbursed for the trustees or make provisions for paying a fixed fee for their work. In general trustees charge a professional fees which can be based on the amount of hours spent or some % of the assets managed. So you need to take a decision. Having said above points you need to address many situations before you form the type of trust you wish to.So look at it in detail. Could you please advice on the tax implication in the hands of (Settlor and a Trust) if a settlor transfer his bank account balance (including FDs) to Trust bank Account? From taxation perspective the income tax of a private trust is assessed as an individual and so the rules of individual taxation applies to the trust. This will include clubbing of income, gifting etc. In my view a settlor can contribute funds even after set up of the trust. There will be no tax liability on the trust if the relation of settlor with beneficiary is exempted under income tax provisions. However, the income from those funds may fall under clubbing provisions if beneficiary is a minor or a housewife. Much depends on the status of the trust. Need to look at more comprehensively. I hope this answers your query. Will be good if you also get a view of a tax expert. Do you prepare or manage trust and Will and work as managing & holding trustee or Executor of Will. As of now we only help in drafting a Will and the trust deed. We do not have executor or trustee services at present. I asked this question as, we(The Karad Urban Co Op.Bank Ltd.Karad) works as Managing & Holding Trustee for Public and Private Trusts. Also Executes the Will as Executor of the Will. Our working area is Western Maharashtra cities like Satara,Karad,Sangli,Kolhapur,Solapur,Pune, Mumbai. If any one want any kind of help in the said subject matter kindly convey me. GOAL: To form a Private trust for family with few family members as trustees and rest all family members, including the trustees, as beneficiaries. The Trust will be formed either using all movable property (Cash, Bank Accounts etc.) or a mix of movable as well as immovable assets transfers. The goal of trust is to invest money in business or businesses and earn money to disburse among beneficiaries. The investment in the business or businesses by the Trust is to be done through a “Limited Liability Company” formation. Is it advisable to go through this two tier system or forming a Private trust only with direct investment in running business is good enough? Do you have information of any good Property Lawyer, CA, or Property Consultant in our area (i.e. Ranchi, Jharkhand)? If not, is it advisable to go ahead with in consultation with some out of station Lawyer, CA, or Consultant? Thanks in advance for your valuable advice. In general running a business through a LLP and then making a trust is a viable option. But in my view this structure is more helpful when you wish to run multiple businesses through different entities. It’s there then the holding all the entities under a trust ensures their continuity. Still I may not be able to answer you appropriately on the legalities and taxation aspects of such a structure. It will involve consulting legal and tax professionals. In my view you can consult any good lawyer even outside your city. I am not aware of any from your respective location. I have Few Question regarding Creation of private trust? 1. Can A govt Leased property registered as a property of private trust? 2. What is Procedure for Creation of Private Trust. 3. If by any Chance any rule is broken or terms are Breached Who will be Responsible for it? 4. What the Rules for Governing Trust prior to Independence? Much depend on whether govt. allows the transfer of leased property. Your lease deed must state that the property can be transferred. In few lease deeds I have seen no transfer is allowed without approval of the lesser. You have to identify the structure of the trust to be created, identify trustees, beneficiaries and how assets are going to get transferred. Then you have to draft a trust deed and get it registered at sub-registrar office. Here you will need 2 witnesses. While drafting the trust deed there are few aspects which you have to look at to ensure right provisioning is created in the trust. The trustees are responsible for functioning of the trust as per laid down in the trust deed. If there is any breach of trust by them then the Trustee who actually do it is responsible for his act of action. There are specific rules in Indian Trust Act on breach of trust. All private trust are governed by Indian Trust act 1882. There have been amendments to it but this is the act under which private trust works. Apart from this there are specific states who have their own trust act which governs Trust in their state. I hope this answers your queries. When a private trust objective is achieved then the assets are distributed among the beneficiary.There is no tax implication when the assets go to the beneficiary on dissolution or extinction of a private trust. However, since its transfer of an immovable property, the stamp duty will be applicable as per the state laws. Very good article. I want to register my private trust in Pune. I visited trust commission office in Pune, sub registrar as well. Both office were not ready to register my trust as they do not provide service. Can you please let me know process of registering trust in Pune. Registrar office only take care of the registration. For drafting trust deed and other services you will need services of a professional. Once you have drafted a deed then you can visit sub registrar office for its registration. There is a specific process and cost for registration of a trust which you can know from the professional you are working with. If you are interesting in discussing more about the trust formation you can let us know. Very good article. For a private specific trust what type of bank account can be opened? Savings or Current Account? I queried about this with a local ICICI Bank branch and was told that it should be Current Account. For current account there seem to be monthly charges to be paid to the bank. Is a current account mandatory? Can a trust hold more than one back account and transfer funds within its own bank accounts? Yes. There are some restrictions on opening a savings bank accounts by a private trust. Many banks allow it only for non-profit making trust i.e. mainly charitable trust. You can enquire with other banks too for clarification. Opening for more than one bank account by Trust may not be permitted by many banks. However, need to look at RBI rule on opening of accounts by a trust. May be you can enquire with few banks and see what they say on this. What are the annual compliances for a private trust in India? Will email you the reply. Can I form a trust for providing safeguard to my land as well as library ownership to my children only ? Is it true that trust could not be transferred or sell to any body else under any circumstances ? In my case which kind of trust would be suitable because land is immovable property while Library will be profit earning. Kindly remove my doubt & suggest the best options in this case. First thing first your parental land should be in your complete ownership.I am assuming you have received it through inheritance. If your brother/sisters or anyone else hold an equal ownership then their consent will be needed for you to start any kind of business on the land. A trust is a viable structure for succession planning but may not hold good in all situations.Here your objective of running the library business under a trust need to be assessed in detail.Also, under a trust the ownership is not with any indvidual. Your children will be beneficiary and the trustees will be managing the assets. Your children will derive the income benefit. The trust deed will define the distribution of the income to your children. So there are many aspects which need to be looked at to decide what structure will be good in your situation.If you need a discussion do let me know. Jitendra Sir, very useful link. I have registered Family trust deed at sub registrar. However, I want to make some amendment, what is process to be followed. Is amendment registration mandatory. 1. The trust deed should carry the provision specifically as to when can the trust deed be amended and by whom. If it mentions this provision clearly then the trust deed can be amended to the extent of the provision mentioned in the deed. 2. Even if provision is not mentioned then if all beneficiaries and trustees consent is there that the trust deed needs to be amended for future benefits then it can be amended. However, if any beneficiary is minor then you require district judge consent on his/her behalf to give the consent. If even one of the beneficiary do not agree then the amendment will be difficult. So you need to check the trust deed or discuss with all the concerned persons attached to the trust in any manner to look at amending the deed. In my view you will have to approach the court as a procedure to amend the trust deed. I will have to check with a legal expert on this.But yes all amendments will have to be surely registered. Thanks Sir. I have following point in registered trust deed. The right to change, amend or alter any of the terms or provisions of this Trust Agreement at any time. All changes, amendments or alterations must be written and will not become effective until signed by the Trustee and Grantor. Do we need all beneficiarys to give consent or only Grantor and Trustee can go for amendment. Do we need to go through adjudication process for this as well as we went for trust deed. Thanks in advance. Really appropriate your efforts in responding all the queries. If this provision is carried in the trust deed then the Trustee and Grantor Can amend the trust deed. However, beneficiaries too have some rights. In case they are major then you might have to discuss with them what amendment is being done and why. They have every right for objection if they do not find the amendments suitable for their rights. The matter can even go to court if they object to it. So taking their consent in such case may be required. However, if they are minor then Trustee may proceed with the amendment. But any amendment will have to get registered since this is a registered trust deed. I hold two flats in same building. Ownership of both proeprties are myself and my wife . I have invested in stock market and going to invest more. I also owns two flats and land in other location. I want to form a trust to hold all this properties and also to start the new business. (my self as a trustee and my self,my wife and two children as beneficiary.PLease guide me. A private trust can be formed only for managing your assets. The trust will manage your properties for the beneficiary you will illustrate. Although business can be managed by a trust it changes the tax structure of the trust in few situations.It will be good if you have a telephonic discussion. Difficult to provide detailed information here. I also want to do some charity through this Pvt.Trust. is it ok.
Is there is any less tax liability to hold the properties through pvt.trust.? A private trust was formed in the year 1995 for maintenance of the properties belonging to a mosque and the primary objective of the trust is to maintain the said mosque and to contribute to the development of the surrounding areas. Initially, the trust was formed with three trustees and all the three trustees have now expired. Can the current set of trustees amend the trust deed? If yes, to what extent can the amendment be made? Need to look at the trust deed for the provisions. If it carries the authority to amend the deed as per situation then trustees can do it. But will be difficult if the trust deed does not mention it. Rest the structure of the private trust also need to be known to give you any details. The provision of the Trust Deed needs to be looked at.If it does carry the authority for amending the trust deed then iit can be done. But if the trust deed does not mention it then will be difficult. Rest info on the structure of the trust is also required for any details to be given. Can i open a trust with intention to separate my personal assets with my business? That means any personal liability does not effect my business and any business liability does not effect my assets. I want to manage the trust by myself and beneficiary as me for a period of 15 years. A sole beneficiary cannot be himself a trustee in a private trust but a trustee can be one of the beneficiaries. So you can create a trust for the purpose but you will have to look at a different structure.